Editor’s note: This is the ninth essay in a 12-part Father’s Day series entitled, Honoring Fathers Who Serve. In May, we asked readers to submit essays about the men who have served our country. 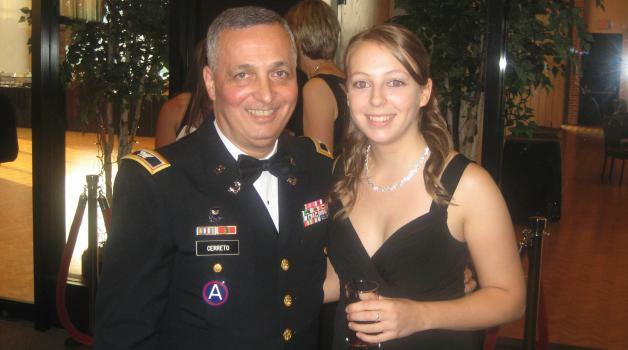 Col. Joseph Cerreto (RET) and Amanda Cerreto at his retirement at West Point, NY, 2010. My father, Col. Joseph Cerreto, served in the US Army Reserves for twenty five years. I was raised in the military environment and was taught respect, loyalty, and honesty. When I was young, we would army crawl across the living room for fun and I used to sit in his helmet as an infant–I preferred it to any other seat. In his long career, he served in many units, including the Criminal Investigation Division with the Third Army in Iraq from 2003-2004, and ended his career as the Commander of the 4th LSO. His deployment to Iraq was the hardest thing to do for him and our family. I was only sixteen at the time, and the house felt different from the moment he was deployed on Valentine’s Day in 2003. While he was deployed, he missed his 25th wedding anniversary, my sixteenth birthday, and the birth of his first grandson. However, when he returned, he brought with him a greater sense of humanity and camaraderie. While he hesitates to fully share his experiences with us, it is clear that his perspective on life has changed. As a direct result, our lives have changed, too. When I think of my father and the lives he has touched, as well as the moments that have moved him, I am reminded that every day is a gift. As a child of a military officer, I know I hold a special position in this world. In addition to my family, I have an entire extended military family behind me. Ours is a bond that people outside of the military could never begin to understand. I consider myself lucky to have a father who served in the Army, especially one who made it his career. Though he doesn’t know it, his service motivates me every day to be a better person and to try and make a difference in the world. The core Army values I was raised on will carry through my entire life, and I will be forever proud to be an Army Brat. Amanda Cerreto works for Pearson Education as an editorial assistant. For fun, she plays softball and participates in mud races. Amanda resides in Cortlandt, New York. Service man and woman or their families no matter what service that they served in.